Summer heat is on! Bikinis, trunks, sunglasses, white sands, and plane tickets are most of the word of mouth in every crowd. But what if you appreciate the fun by staying at home, strolling at malls, or watching movies with friends? Well then, here are some of the must-watch movies this coming summer 2012! Dr. Seuss’ The Lorax – If your little brother, sister or cousin keeps on whining in your house, why you won’t try to go in theaters! This movie is about a boy who searches for a real living tree in order for him to win the heart of the girl he wants. For him to find the forest, he must know the story of Lorax, a creature who lives to fight for his world. This is from the creator of Despicable Me which is voiced by Zac Effron and Taylor Swift. Now Showing! Corazon, Ang Unang Aswang – There are lots of Filipino myths regarding Aswang but this movie narrates how Aswang existed, the people who started it all. The story begins to a girl whose faith is being tested and how long she can do to get what she wants. The story revolves in the Japanese era with two couples having a hard time to conceive a child. A stranger suggested to them to worship a patron of fertility then their prayers are answered. However, what are the consequences of the answered prayers? Now Showing! Jack and Jill – If you want to make yourself laugh then Jack and Jill movie is a great choice. Jack is a successful advertising executive in Los Angeles with his family however here is Jill, her twin sister, would come to visit Jack’s house. Jack’s peaceful life starts to ruin when her twin sister came to their house. A very exciting movie because Adam Sandler will both play the boy part and girl part that makes the movie funny! Now Showing! The Hunger Games – This is from the the best-selling epic novel that is all about selecting one young man and one young woman for the honor of representing District 12 – 74th annual Hunger Games. Hunger Games is for their nation’s entertainment and for government intimidation policy. Hunger Games is a televised event in North America in which the representatives or the so-called “Tributes” should compete with one another until one tribute stands out and win. Katniss volunteers for her younger sister to be the tribute and her journey begins. In theaters in March 21, 2012. 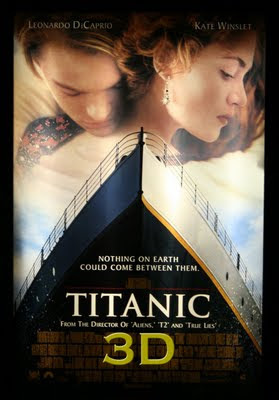 Titanic – We were once fell in love with the narrative story of a 100-year old, Rose and now the pride and joy of the White Star Line, Titanic, is back on screen but now in 3D. The “ship of dreams” will sink in our own very eyes. Titaniccarried 1,500 passengers and lead them to death because of the ice cold waters of the North Atlantic last April 15, 1912. Cabin in the Woods – Most of the fun comes when you are with your friends! The Cabin in the Woods is an example of teenagers who try to explore the place that didn’t even existed in the GPS. As they get into the remote cabin, little do they know that they are trapped in artificial woods surroundings and that the place is controlled by a system. Showing on April, 2012! The Avengers – Who doesn’t know Iron Man, Captain America, The Hulk, and Thor? What if these characters are in one movie to save the world? Marvel Studios made it possible! The story opens where the war begins and the four super heroes qualify to Nick Fury, the director of international peacekeeping agency known as SHIELD. See how these four heroes power to wow the visual effects of the movie. Showing on April, 2012. Dark Shadows – We have been plagued by the vampire century ever since Stephenie Meyer’s novel, Twilight Saga, boom in the movie industry. With that, here comes a movie that is based from a gothic soap opera aired in ABC network back in 1966-1971. In the movie, Barnabas (Johnny Depp), the master of Collinwood Manor, will play the leading role as the human turned vampire because of breaking the heart of a vengeful witch, Angelique, and buried him alive in a tomb. After 200 years, his tomb is accidentally opened and Barnabas came to his outstanding and splendid Manor ruin. As he came to his Manor he found out that it is live by his descendants with has its own secrets. Showing on May, 2012. Battleship – There are lots of movies that are video game-based and this is one of the sample! In the Hawaiian Islands, an international naval fleet is in a battle with the aliens known as the “regents.” The goal of the regents is to have an activity to build a powerful source into the ocean and so the battle begins. Showing on May, 2012. Snow White and the Huntsman – We’ve known Snow White as modest but in this movie, Snow White is bold. Evil queen only wants to be the fairest of all but Snow White existed and so she plans to destroy her. But the bad ruler did not know that the girl she is planning to destroy is in the hands of the huntsman to train the art of war! Kristen Stewart star as the girl who has skin as white as snow, lips red as blood, and hair black as ebony! Let’s see how she plays as the brave girl. Showing on June, 2012! These are the top 10 movies must-watch this summer! If your family is not in plan to go out on a trip, why don’t you try to watch a movie with your family? If friends run out of money to have a summer getaway, a cheaper entertainment is here! Sit back and relax with mouthful of popcorns in your hands. This entry was posted in News and Entertainment and tagged Dr. Seuss’ The Lorax movie, great movies to watch for summer 2012, Top 10 movies to watch this summer 2012. Bookmark the permalink. I really wanna watch Titanic! Thanks for updating me! I already watch Jack and Jill! It’s nice!